Ignition wiring with factory tach? 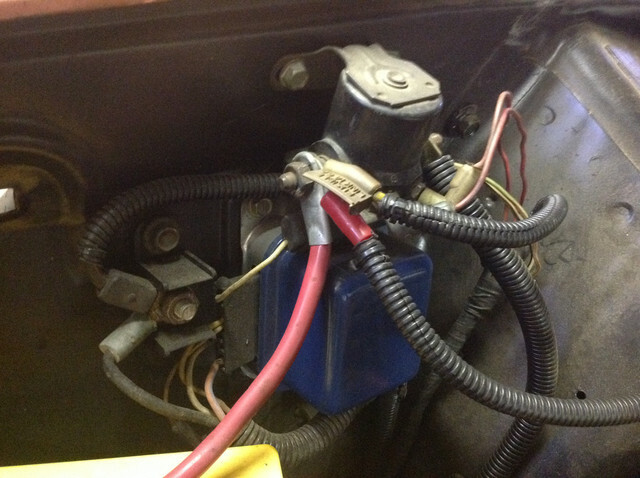 › Ignition wiring with factory tach? This is a 73 which did not come with factory gauges or tach. They were swapped in a decade ago along with rebuilt 71 Lincoln 460 with DOVE heads and CJ toploader which replaced 351 and C6. Not run since installed, except when hot wired. 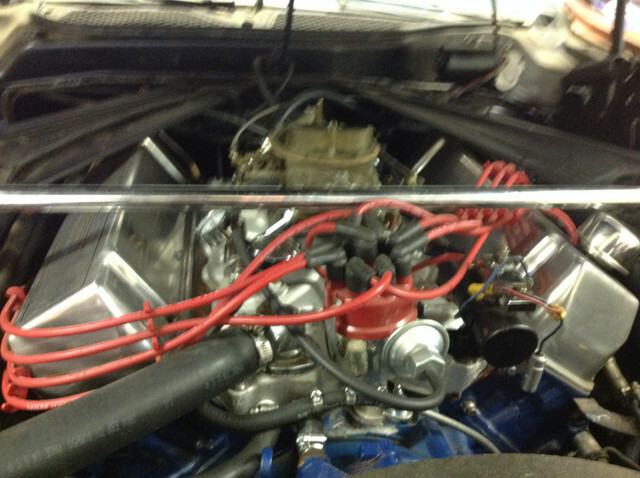 Has factory 71 Lincoln coil with a resistor mounted on it and a Mallory dual point ignition. Starts only by jumping full 12 volts separate wire direct to coil on startup. Of course, it has been so long ago that I abandoned this project in my garage that I have forgotten exactly what I swapped in, but believe I had scrounged up all the wiring for factory tach and gauges off EBay and a nearby salvage yard and had installed them. Trio of factory gauges (ammeter, temp, oil pressure) appears to work when ignition key is in "on" position and engine running. Tach apparently doesn't work though and engine starts running rough and dies if I take the "Hotwire" off coil. Also there are 4 wires on two connectors hanging down from firewall (which I assume are backup lights and neutral start switch) and are not connected to anything.. Engine still cranks with key though, so don't think those are related to my lack of ignition voltage. Backup lights irrelevant and engine would not crank over at all if an open neutral start switch was the culprit. Car was previously equipped with a C6, but am guessing replacement wiring must have circumvented that switch for it to even crank over with key. Using a test light, ignition hot wire appears to have a nominal current to coil wire after the resistor in "on" or "start" ignition key position. But, not much.. Lights up brighter in "start" than "on" key position, but dim in both cases. The 12 volt small test bulb lights up somewhat better when hooked up before the resistor, still somewhat dim in "on" position, but brighter again in "start" position.. I know on most older Fords that the "I" terminal on solenoid would usually have a second wire to coil positive terminal that provided the full 12 volts to coil only when ignition turned to "start" position and solenoid activated. But, this 73 wiring already has a second factory right angle end wire on the "I" solenoid terminal and it only has one ignition wire to the resistor on coil and then another from resistor to the coil positive terminal. I am guessing that maybe, somewhere inside the wiring harness, that wire on the "I" terminal connects into the same ignition circuit that my single coil wire is on and it momentarily sends a full 12 volts to coil circuit when key is in "start" position. 1) Does the 73 wiring by chance have a GM-like resistor wire somewhere in its ignition circuitry, so by use of the separate 1971 resistor mounted on coil, I am actually reducing the voltage twice as much as I should be? 2) Can someone with coil ignition and factory tach and gauges confirm that there is only the one ignition wire to resistor and/or coil on hot side and whether there is even an external resistor present on a 73? If there is a second wire to coil positive terminal, what color and where does it come from? After lots of reading, stumbled across the fact (?) that the ignition current also runs through the factory tach and so if tach fails, then ignition circuit fails also. Not sure what years that applied to..
Aftermarket tachs usually have a wire from tach to negative of coil, but none present here, just a single wire from coil negative terminal to distributor..
3) Shouldn't there be another wire for the tach at coil negative terminal? If so, what color? 4) Is this true that factory tach is part of ignition circuit? And if it is, how come I have any juice at all to coil from factory ignition hot wire when tach doesn't appear to work? Or does tach failure just diminish the ignition voltage, but not necessarily eliminate it? 5) How can I test tach to see if it is bad, and if it is, are they repairable? Pulled speedo/tach gauge assembly back far enough from dash to see that 2 wires plug into the dash harness from tach, so they appear to be connected at that end anyway..
6) Are there any other visible or hidden (or possibly missing) connectors or wires in the tach circuit that I can check to see if present and functioning? Not sure if I should be focusing on tach to see why it isn't working due to suspicion it is disabling my ignition, or if I should be focusing on ignition (or lack thereof..) as being possibly the reason the tach doesn't work - or if both issues are the result of a missing connection, wiring, or a bad tach.. Simple, common-sense practical ideas for figuring this out? Getting frustrated. Thought I was in the home stretch with almost everything new, but since have had steering line leak, several antifreeze leaks, Holley carb accelerator pump leak, wrecked a starter and had to change intake (Weiand Stealth was too tall for Ram Air stuff to allow an air filter...). Got all those other things fixed now. But, after all that I feel like I have only worked my way right back where I thought I started, in that ignition voltage is funky and tach not working. Yes, the factory tach is in line between the ignition switch and the + side of the coil. Ford has a resistor wire from the output side of the tach in the circuitry going from there to the + side of the coil. The factory tach does not use any signal from the - side of the coil. There should not be 2 wires on the I post on the starter solenoid. There may need to be an external resistor on the coil if the coil itself has too low a resistance; the coil needs 1.5 ohms in addition to the 1.5 ohms of the resistor wire. What you describe is a mess of band-aides trying to patch things together to make the car run. A lot of your problems may be related to the headlight harness, which contains all of the wiring for ignition to the starter solenoid and coil, among other things. If the 4 pin plug is truly your NSS/BU switch, there is no way to start the car if the NSS side of the plug is not jumpered. You need someone competent in electrical trouble-shooting nearby to inspect your wiring and determine what the hell is going on. What you describe is almost too complicated to trouble-shoot over the 'Net. midlifeYes, the factory tach is in line between the ignition switch and the + side of the coil. Ford has a resistor wire from the output side of the tach in the circuitry going from there to the + side of the coil. The factory tach does not use any signal from the - side of the coil. There should not be 2 wires on the I post on the starter solenoid. There may need to be an external resistor on the coil if the coil itself has too low a resistance; the coil needs 1.5 ohms in addition to the 1.5 ohms of the resistor wire. It only sounds that way cuz it is..
Good body, but just an abandoned project I took in trade with a bad transmission for a Corvette I had tired of. Was going to just resell the Mustang, but had the rebuilt 460 sitting on engine stand and CJ Toploader. Since those bolt in, one thing just led to another and I developed a fondness for the Mustang, so decided to keep it. But, it being a garage fixture for so many years, I forgot some of what I did to the car. Believe I changed out underwood wiring harness with headlight wiring too, because cars w/o gauges and tach are different than those with gauges. 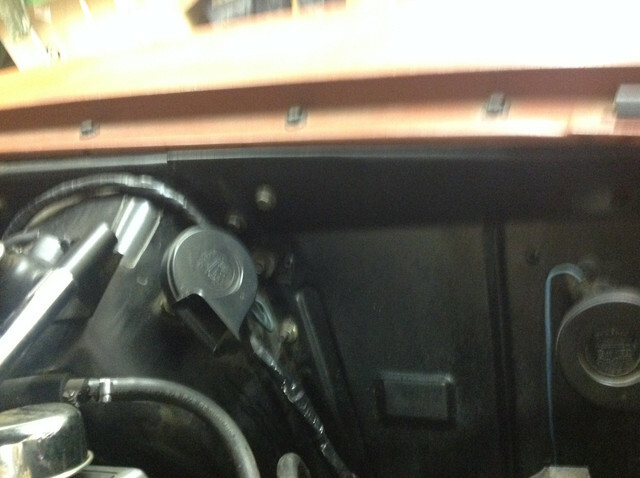 IIR, the Junction block by voltage regulator isn't on non-gauge cars for whatever reason.. (see first pic above). Anyway, learning that it has resistor wire in tach circuit as you said, decided to try by-passing resistor on coil just now and it starts and runs with key and not hot wired. (Figured the most I would do is burn up the stock coil...) Had it running about 10 minutes and coil didn't get hot and tach is working too. First time I have seen it work, so feels like progress even if it isn't the end of issues. However, when I turn off the key, it keeps on running. Choked it to stop motor and checked coil positive wire with key off and it has no juice at all, so almost has to be the ignition circuit is somehow being energized by the alternator when it is running. If it was a wire hooked in the wrong place, it would still show power to the ignition when not running, wouldn't it? Nobody in the immediate area I know of that is a real good electrical troubleshooter, but plan on hauling it to alignment, paint and muffler shops anyway so if I have to haul to Mpls or somewhere I will. You did get me thinking about a street rod outfit about 30 miles away though, that might be up to the task. But I want to be able to start the car to load and unload from trailer. Lot easier to do that than load, unload, move into shops and out if it moves under its own power. Found a bunch of threads on VMF that indicate running after key turned off is possibly due to solenoid or voltage regulator contacts inside sticking. Seems a more common problem than I thought. Solenoid contacts when sticking keeps "I" terminal hot, even when shut off and voltage regulator contacts sticking back feeds alternator output to ignition circuit too apparently. Regulator was new, but I see a 2002 post indicates even new ones can stick contact points, even good brands right out of the box. So, I am going first with the $20 for new Blue Streak solenoid since it still has the original solenoid (one of very few things that isn't new under the hood already) and if that doesn't work, then switch to a transistorized Motorcraft voltage regulator which is supposed to eliminate any possible current back feed issues going from alternator into ignition circuit. A 3rd less likely possibility is worn out ignition switch (really doubtful though in my case, since the hot coil wire has no voltage with key off and engine not running). None of those fix it, then I'll get it in to reputable street rod shop and let them figure it out. Only care to farm stuff out if I can't figure it out myself or don't have the right equipment (paint, custom exhaust, wheel alignment). But, if I can rebuild the motor, the Toploader, the rear end and complete front suspension including brakes, along with rear glass removal and install, door hinge rebuilds and a bunch of other minor body work including functional Ram Air hood and new deck lid, I at least have to give it a shot fixing the running-with-key-off issue first. Have had pro shops throwing parts at my commuter cars that didn't fix the problem initially either, so my throwing a couple more fairly cheap parts at it isn't too big a sin IDT... They just excuse themselves saying the vehicle had multiple issues to cover themselves when they do it. Wish me luck. This is fun, right? Just thought I would update this now that new solenoid and transistorized voltage regulator are installed. Took a while since I am also working on a rebuilt roller 5.0 2000 Explorer motor (now with aluminum heads) for an MGB swap. Swapping out the solenoid on the 73 did nothing, car still ran when key turned off. Found out I was wrong that the voltage regulator had been replaced once I had removed it. It was probably original, just looked new cuz I had apparently removed, painted it nicely and re-installed it when engine compartment was cleaned up for 460 install. So, then installed the new regulator though getting doubtful it would make any difference either. It did though.. Car shuts off with key now. Apparently the car continuing to run when key turned off was due to stuck contacts in the old mechanical regulator. It has a riveted cover, rather than being held on by screws, so couldn't easily take it apart and haven't opened it yet.